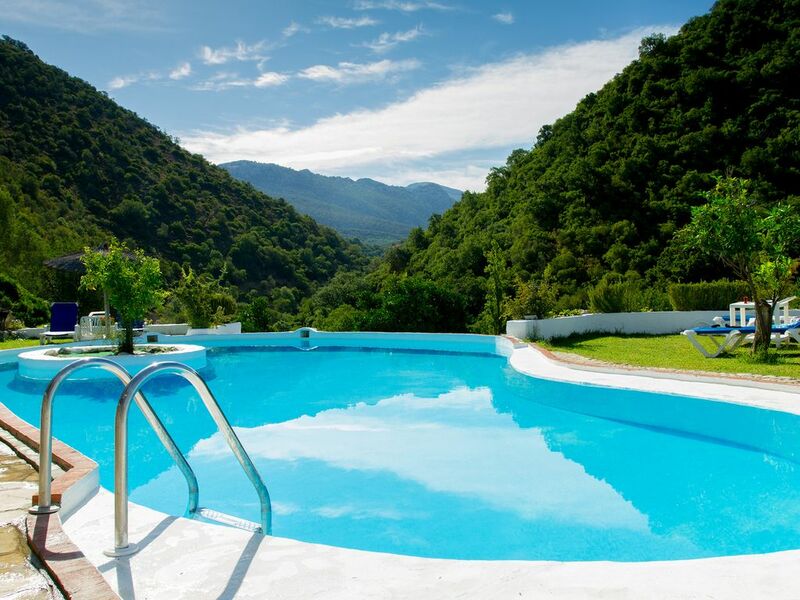 We booked this place for 2 reasons, it took dogs and it said it was in Grazalema, it's not, it's 30+ minutes drive away. There was a 10 minute drive down a very uneven track before you even got to the main road. There is a slightly shorter route but the bridge had been washed away because of the bad weather. The property is in Travisna. We wanted to be in Grazalema so we could walk out every day with our dogs, pop to the town to eat, etc. We could not do that from this location, that's why we didn't enjoy it. When we arrived at the property there was nobody to meet us, no instructions as to which cottage we were staying in and there's no Vodafone mobile coverage so we couldn't call Antonio. We had to assume and move into a cottage that was unlocked. When we met Antonio in the afternoon he was very pleasant and explained there is wifi if you are in the communal area, but still no mobile coverage. The wifi is very slow indeed. If you are looking for a completely isolated self catering break I'm sure this place would be suitable, but take everything with you. Sorry Antonio, we hope you will take our opinions as useful. Buenos dias, en respuesta a su comentario, quería aclarar unas cosas, la finca se encuentra en EL PARQUE NATURAL DE GRAZALEMA, en ningún momento decimos que se encuentra en el pueblo de GRAZALEMA, esta a 15 minutos de dos pueblos, , Ubrique y El Bosque, estos últimos meses, por las intensas lluvias se nos llevó un puente, y a habido que poner un camino provisional, un poco más largo, que el principal, el cual ya acabo reparado, y se puede acceder por el principal,, este cliente intentamos contactar con el, en varias ocasiones , para la hora de llegada, y recibirlo en la finca, como es lo habitual que hacemos con todo el mundo, pero en ningún momento pudimos contactar con el, y pusimos la llave en la puerta para que pudiera entrar en el momento que llegase, y no tuviera que esperar, sentimos las pequeñas incidencias con este huésped, nuestra intención siempre es que nuestro hospedados, se sientan lo mejor posible en su estancia en nuestro alojamiento, y repitan, como es lo que su sede en la mayoría de los casos, UN SALUDO Y MUCHAS GRACIAS POR TODO. I stayed here with my three children and it was the highlight of our vacation. When we arrived we met the owner, Antonio, who started by giving us a crate of oranges from the many orange trees on the property. The kids got a kick out of making fresh juice with them in our well appointed kitchen. Also there were many animals that the kids were excited to see, a donkey, many sheep and lambs, some chickens and even a turkey. The pool was beautiful and looked out over the mountains, surrounded with oranges, rosemary and landscaping, it was where we spent the majority of our time. There is free WiFi on the property and some hiking trails along a river. It was situated at the end of a road about 15 minutes from Ubrique and not too far from El Bosque. All in all, it was a perfect vacation spot, far removed from the hustle and bustle of the city but close enough to grab dinner or coffee whenever you wanted. I cannot recommend this enough, it was simply a perfect place to unplug and enjoy Spain. The owners and their staff were the icing on the cake, kind, considerate and helpful. Personally, I would come back to Spain just to stay here again! BUENAS MELISSA, SOIS UNA FAMILIA ENCANTADORA, DIGNA DE ALOJARSE EN MI CASA, LA TENEIS A SU DISPOSICION CUANDO LO DESEEIS, MUY AMABLE Y AGRADECIDO DE SU COMENTARIO, QUE TENGAIS TODOS MUCHA SUERTE, UN SALUDO PARA TI Y TUS HIJOS, MUCHAS GRACIAS POR TODO..
Lugar ideal para relajarte en familia con mascota. Casa confortable y zonas comunes muy recomendables. Anfitrión muy hospitalario. Alrededores permiten disfrutar del entorno. Die Ferienwohnung hat unsere Erwartungen voll erfüllt. Nach den oft sehr anstrengenden Wanderungen und Besichtigungen in dieser Region war die ruhige Lage und das Pool der Finca für Regeneration und Entspannung ideal. Sehr freundliche und hilfsbereite Haltung des Vermieters.